This is by way of an addendum to the last blog about trees. I'd gone into our local Mairie to ask permission for a bonfire (prohibited during the "summer" months) to get rid of the brash or trimmings that Duncan the tree-surgeon had recently removed. He felt unable to give me the authorisation and also expressed a concern that it was the wrong time to cut our oaks. The “proper” time to prune deciduous trees is during winter, when the leaves have fallen off and the energy of the tree has descended into the roots and it is therefore OK to lop off branches without killing the tree. 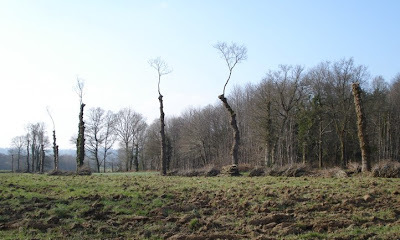 It’s even possible to chop the tree down completely and new growth will emerge from the stump in spring and this is the principle behind coppicing, where a crop of wood is taken—for example, every seven years—the stump regenerating to provide further crops every so many years. 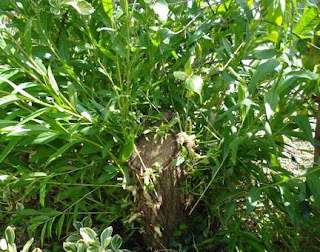 (The photo shows a willow tree I cut down in the garden during the winter, which has coppiced. I want it gone, so have chopped off the new growth for the illustrative photo, then cut off the rest to exhaust and thus kill off the stump. Nice tree, wrong place; we’ll replant with something more suitable). Well-managed coppice stools can survive for hundreds of years and even outlast standard trees of the same species. Pollarding is coppicing but at a different height. The crown of the coppiced tree is not at ground level but higher up. Trees in urban/suburban streets are often pollarded over winter, to keep their size and shape in check. 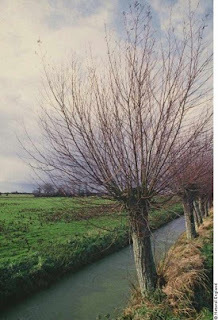 Pollarded willows by riverbanks are also a common site (see photo © Natural England). Pollards can raise the tasty new shoots above grazing height—natural protection from rabbits and deer—or just to allow animals to graze underneath, so getting multiple outputs (a very permaculture concept) out of one piece of land. Here in Brittany, they practice a different form of coppicing, the English term for which is “shredding”. This involves cutting all the side branches and sometimes the top as well to leave a bare telegraph-pole of a trunk (see top photo, taken last winter). Side shoots re-grow and one new branch at the top will assume “apical dominance” to continue upward growth to the trunk. I used to think that, in the early stages, at least, the trees had lost their shape and were not nearly as aesthetically pleasing as a coppiced or pollarded tree. However, Ben Law argues (in The Woodland Way: A Permaculture Approach to Sustainable Woodland Management) that shredding “offers one of the most productive uses of trees, especially in the farm situation where fodder is needed for livestock.” I’ve been unable to find out exactly why they do this locally, or what they now do with the trimmings. In the old days, the smaller trimmings were bound together in bundles—called faggots—and sold to the boulangerie where they’d fuel the bread oven. I’ve been told that oak leaves have too much tannin in them to be useful as animal fodder but I don’t know that for sure. Maybe they continue to shred the trees out of tradition yet I’ve also been told that it’s to reduce the shadow cast over crop-growing fields … as I say, it remains a mystery to me. I have, however, come to accept their shape as part of the worked countryside. 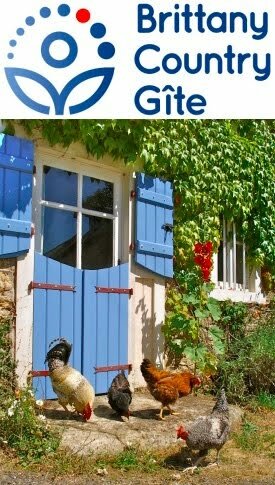 I think that this was why the Maire (mayor: for us a sheep farmer, Jean Luc, who is in the Mairie just two afternoons per week) was concerned that our trees would die, perhaps another example of the English newcomers to the countryside not really knowing their ar—s from their elbows! But no: Duncan hadn't shredded the trees, rather just removed deadwood and judiously pruned out some other branches to let more light in. The amount of growth he removed won’t harm the tree. On the contrary, they are all now in better health. A deciduous tree that is actually best cut in the height of the summer is the cherry (or plum) in order to avoid silver leaf disease getting into the tree through the cuts, and so I’ve given all ours a trim recently, a process (tree pruning, that it) that I find very meditative and relaxing, ahhhhh!